If you can't see the pictures, right click on them and select view picture. If that doesn't work try just clicking on the picture. 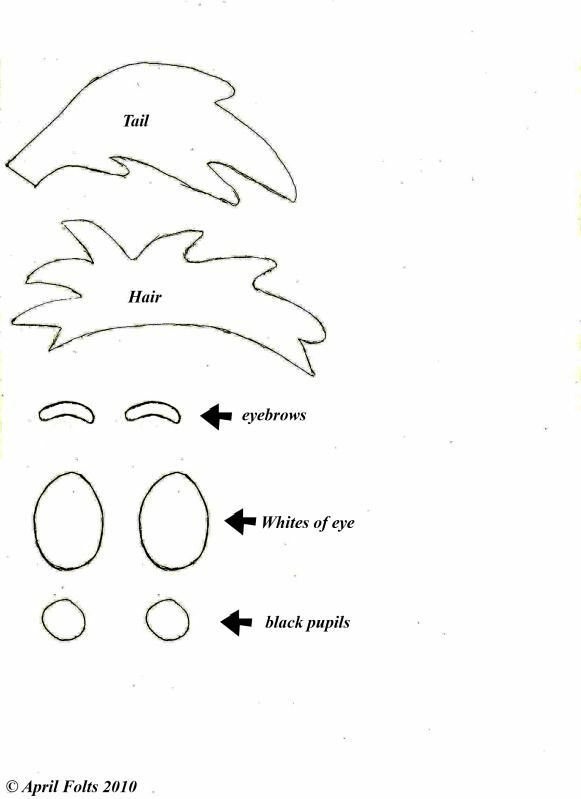 Other Materials: Dark Brown, White, and Black Felt. A hot glue gun or a needle and thread. Place peach on top of warm brown and sc them both together around entire piece, sew to head. This pattern hasn't been tested yet. I wanted to get it up before Christmas. If you run into any errors please let me know so I can fix them. I'm very glad to see that you were able to rename and repost this pattern. I was in the middle of making the body and was terribly disappointed to see that it had to come down. 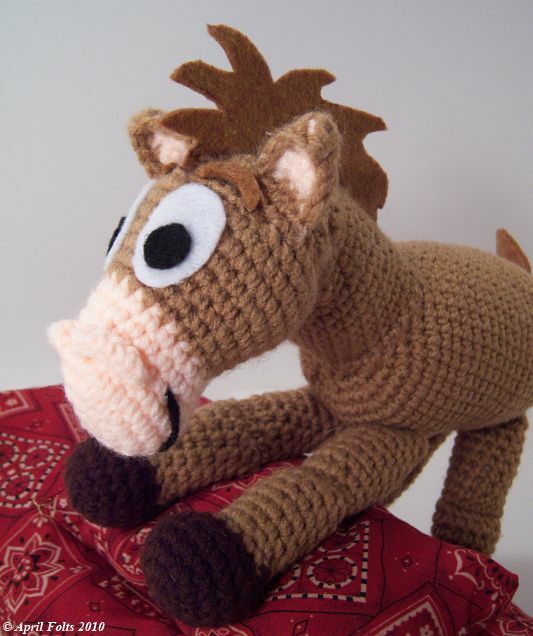 My kids will love "Brown Pony" and may even rename him ;) Thanks for all of your awesome patterns! I am so glad you were able to re-post this. Just today I was looking at this and was very disappointed it was removed. I had to go out and left this up and when I came back I thought I would ck again to be sure I couldn't print it out, and there it was. My grandbabies got Woody and Jessie for Christmas, but we couldn't find the pony. My 2 yr old (who was getting the Woody )had to go to the ER Christmas Eve, we thought she was dehydrated from the flu and they would give her some fluid and she would be back. After a near death experience she was transfered to Lebonhuer's and spent Christmas Day in ICU. She has Type I diabetes. (I said Santa wasn't good to her, Bad Santa brought diabetes). Her birthday is Jan 22 and this will be great to go with her Woody and if it turns out good, Jessie will probably need one. Thank You so much!!! wow!! just lovely :)! thank you for sharing the pattern!! How cute!!! You are just so talented. I love your patterns. I am starting the "brown pony" now. I am so excited :)Thanks again for this great pattern!! Love this pattern! I used it to make a rocking pony. The pattern is absolutely super. Thanks so much for sharing this one with us. I LOVE your patterns and think you have amazing talent. I can't wait to recreate some of the item you've come up with. Thank you for being so generous with your talent! Thanks for the heads up! I am printing the directions now so I can make for my son for his 3rd birthday! Can't wait! LOVE this pattern!!! So glad you were able to repost this pattern. My son is going to be so happy, after I suprise him with it. One question, is this on worsted weight yarn? I am all finished with the pony! I just have to cut the felt and put it on. The pattern was wonderful and very well written. Thanks again! Going to post some pictures soon. Do you mind if I post them on Ravelry with a link to your pattern? Thanks Everyone! sorry it took so long to respond. I have been super busy lately. Thank you for the pattern!!! Love this pattern!! I am almost finished and need to start his head. I was wondering what peach yarn you used for the snout? I have been looking around and can't seem to find anything I think is appropriate! TIA!! I came across this pattern a while ago and bookmarked it, I came back to it and it was gone!!! I thought I imagined it. 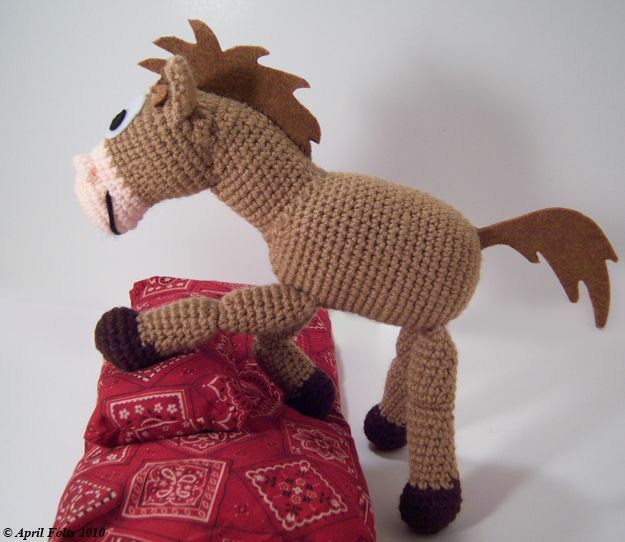 But I found your 'brown pony' and was able to make it for a girlfriend of mine, as a gift for her unborn baby. I wanted to say thanks and your patterns are awesome!! Your so generous. This looks absolutely fabulous! 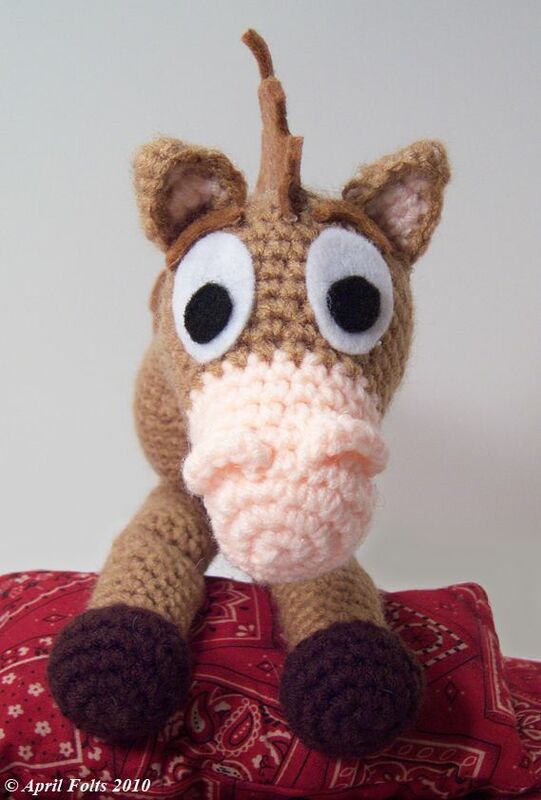 I told my son I would knit him a Bullseye horse, so I am definitely going to use your crochet pattern as a reference! Thanks so much! Thanks for sharing! He's just lovely! I'll post a picture when I made it for my baby cousin. Just wanna say how amazing your patterns are. I made a mini version (bout 5in tall) of jack for my hubby and he loves it. Big plans to buy some of your patterns for this coming christmas. Cant wait to start on cosmo the dragon. 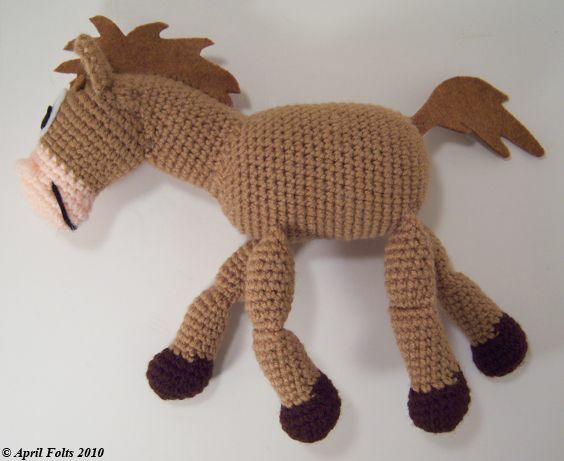 Is there anyone out there that can make me the 'brown pony'? My nephew's birthday is coming up the end of September and he is in love with Toy Story. He has a Woody doll and I thought this would be perfect for him. Unfortunately, I am just starting out crocheting and am completely overwhelmed when I read through the pattern directions. It would be much appreciated for any help on this. I made one Horse by your Pattern. I'm very excited to make this for my daugher! I have a question, though. I'm on the body, and am having trouble figuring out rounds 4-6. When I add up the number of stitches that should be in each round, I am coming up with a different number. If i do 2 sc in each stitch in round 4, I keep thinking I should I end up with 48 total which changes the total for rounds 5 and 6. Can someone help me with this? I've got my 4 legs done already!! Lovely pony :-)!!! Thank you for pattern ! Oh, my gosh! You NAILED this! Its perfect. I have crocheted 2 of them and am starting my 3rd one. Thanks for much both the lil ones I have given these to love them so much. How big is the horse? This is so gorgeous! My siblings and I love toy story (I was just 11 when the first one came out). My mum hasjust taught me the basics of crochet and so I'm diving in the deep end by having a go at this, and I'm doing quite well so far, they're great instructions! I was just wondering, in round 7 for the feet, could you please tell me what you mean by 1ss, ch1? I assume it means slip stitch, but I'm not sure where, and is it just one or all the way around? I dont understand the ears...do i start with a magic ring? Does anybody know how to do the ears? Hello:) i have a problem with this instructions...I'm from germany and i dont understand anything that here stands...My englisch is not so good but i'm looking so long for this instructions...I dont find in german only in english..can someone help me to translate this instructions in german? That would be very nice. I wonder if you would allow some of these to be made and sold to raise funds for a charity? I'm doing a stall for a charity I'm fundraising for (Friends of the Dartmoor Hill Pony) and looking for horse themed crafts. Please let me know on melissamariephillips@gmail.com either way, thank you :) Beautiful work by the way! Hi: do you still have the woody doll pattern? Can you post it? Awaiting your reply and thanks in advance.